For family tree see Ancestry [subscription required]. 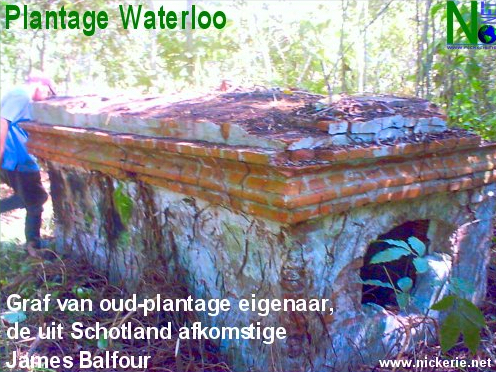 See also Philip Dikland's history of plantations Waterloo, Hazard, and Berlijn. James Balfour [1777-1841] was a Scot who worked as a doctor in Berbice and Demerara and then acquired plantations in Nickerie, Surinam, where he became notoriously wealthy. 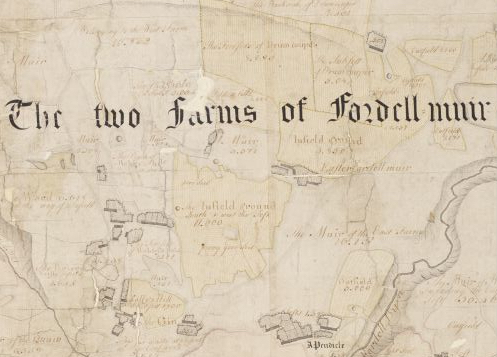 He was the son of David Balfour and Janet Braid of Fordell Muir, in the parish of Dalgetty, Fife. His sister Helen married Robert Kirke, a weaver in Carnock (Fife), and their son Robert Kirke - Balfour’s nephew - inherited the largest share in the Surinam properties in 1841. In 1859 Professor George Wilson, in a lecture in Aberdeen to the British Association, reported that:An uncle of Mr. Kirke’s, Dr. James Balfour, who practised medicine in the end of the last and beginning of the present century in Berbice and Demerara, was in the regular habit of employing [electric] eels to give shocks, which he said he had found of great use in the cure of rheumatism. By 1821, in Nickerie, he owned cotton plantations Forgue and Providence and the sugar plantations Waterloo and Hazard. He also bought the wood ground Berlin, on the Para creek, in 1821 probably with the intention of moving its 200 slaves to his cotton and sugar plantations. This led to considerable resistance from the slaves and in 1824 James’s brother, Thomas Balfour [b1774], shot and killed a female slave. He was banished from Surinam but ‘had the audacity to address himself to the Sovereign in the Netherlands in order to obtain pardon or annulment of the award’. [Adriaan François Lammens, Bijdragen tot de Kennis van de Kolonie Suriname: Tijdvak 1816 to 1822 (Stuttgart, 1854 and Vrije Universiteit, 1982)]. Thomas returned to Scotland and became a builder in Dunfermline. His son, Andrew, was an architect who supervised the repairs to Dunfermline Abbey in 1847. The Dutch soldier August Kappler, who was in Surinam from 1836 and recounted his experiences in his Six Years in Surinam [Stuttgart, 1854] described James Balfour as ‘a strange man who had boundless wealth and always wanted more’. At this time he was the owner of 700 slaves. He lived at Waterloo with Herriet Fine Beek, his daughter by one of his slaves, who remained a slave herself until manumitted at Balfour’s death in 1841. James Balfour left 41/48th of his estate to his nephew, Robert Kirke, and smaller shares to other relations. His brother, David [1791-1850] left Scotland for Surinam in 1842 and worked for some time at plantation Waterloo. Robert Kirke's brother, David Balfour Kirke [1819-1850, married James Balfour's 'mulatto' daughter, Herriet [d1858]. The couple had three sons in Surinam, who all died young.